Venus Transit 2012 - A transit occurs when a planet (Mercury or Venus) lines up with the Sun and Earth, and so appears from our home planet as superimposed on the Sun's disk. 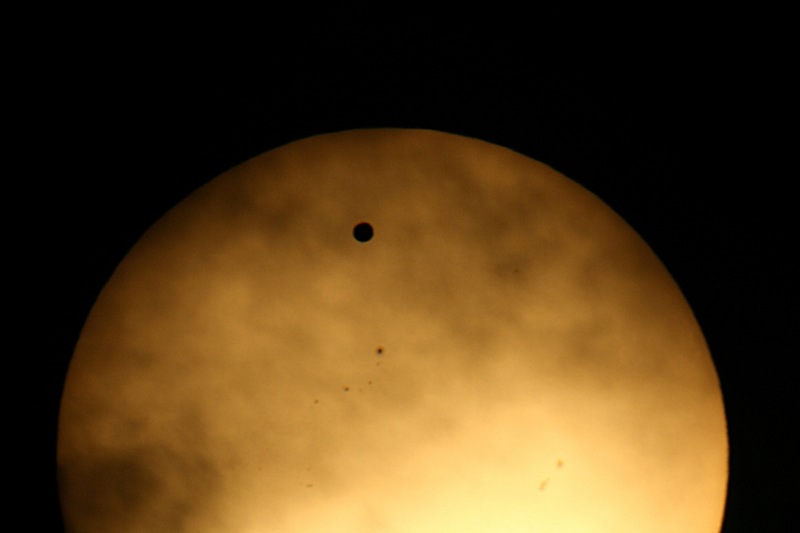 The second and last transit of Venus of the 21st century occured on June 5/6, 2012. This photo was taken from my house in Saida, Lebanon where the transit was visible at sunrise through some cloud cover. The black disc is the planet Venus, while the larger one is the Sun. Several sunspots and a thin cloud cover can also be seen. The next transit of Venus will occur in 2117!